NASA astronauts Rick Mastracchio and Mike Hopkins (in suits) try on their spacesuits inside the International Space Station on Dec. 16, 2013 to prepare for a potential spacewalk repair of the outpost's cooling system. A cooling system malfunction on the International Space Station has delayed the planned launch of a private cargo ship to the orbiting laboratory this week as engineers discuss whether astronauts will have to perform a spacewalk repair on the outpost. The station's problems began last week, when a control valve in one of the station's cooling pumps malfunctioned, requiring the shutdown of some support systems for the orbiting outpost. The problem does not threaten the safety of the six astronauts currently living aboard the space station, NASA officials said, but fixing it is a high priority. This photo shows the location of the S1 Pump Module on the International Space Station. Image released Dec. 12, 2013. 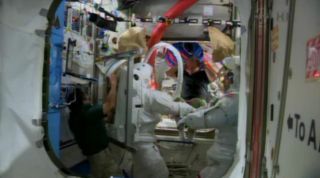 Space station astronauts Rick Mastracchio and Michael Hopkins may need to make a series of spacewalks beginning Thursday to replace the affected cooling pump, officials said. The astronauts tried on their NASA-built spacesuits today (Dec. 16) to prepare for the potential in-orbit repair job. If necessary, the spacewalks would delay the launch of aerospace firm Orbital Sciences' unmanned Cygnus spacecraft, which is currently slated to blast off on its first contracted cargo run to the space station on Thursday evening. However, no final decisions have been made about what will happen Thursday. "The International Space Station Program continues to keep both options on the table pending further engineering analysis and troubleshooting efforts on the station’s cooling system," NASA officials wrote in an update on Sunday (Dec. 15). Meanwhile, Orbital Sciences' Cygnus team is continuing to prepare for an on-time launch, loading the final cargo into the spacecraft. If NASA gives the go-ahead, rollout of Orbital's Antares rocket to the pad at the space agency's Wallops Flight Facility in Virginia will occur early Tuesday morning (Dec. 17), company officials said. Virginia-based Orbital Sciences holds a $1.9 billion NASA contract to make eight robotic supply runs to the space station with Cygnus and Antares. Thursday's scheduled launch would initiate the first of these eight missions, though Cygnus did launch on a successful demonstration flight to the the orbiting lab in September. Orbital isn't the only private firm with a NASA cargo deal. California-based SpaceX signed a $1.6 billion contract to make 12 flights with its Dragon capsule and Falcon 9 rocket. The company has successfully completed two of these contracted missions already, with the third slated to blast off early next year. Editor's Note: This story was updated to correct the scheduled time that Cygnus is expected to launch on Dec. 19.